to select or recognize what is best, more useful, etc. 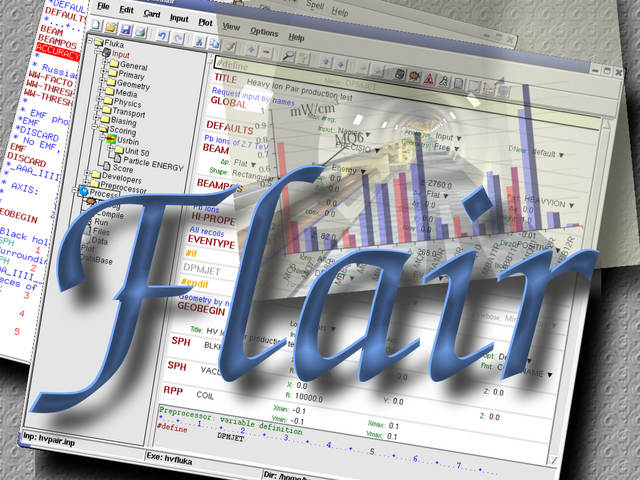 flair is an advanced user friendly interface for FLUKA to facilitate the editing of FLUKA input files, execution of the code and visualization of the output files. It is based entirely on python and Tkinter. The philosophy of flair interface was to work on an intermediate level. Not too high, that hides the inner functionality of FLUKA from the user, and not so low that the user is in constant need of the FLUKA manual to verify the options for each card. Flair works directly with the input file of FLUKA and is able to read/write all acceptable FLUKA input formats. In the input editor the user is working directly with the FLUKA cards using a small dialog for each card. The program displays the card information in an interpreted human readable way. The only exception is that the cards in flair are so called extended cards where each card is not composed only by 6 WHATs and 1 SDUM but rather they contains all related information in one unit (comments preceding the card, continuation cards, titles etc).